Open an application by using a button from your desktop...hard drive. That’s the promise of the new LaCie Starck Desktop Hard Drive, a creatively-designed USB drive that features an unconventional aluminum case design and some equally distinct features. Over the years, LaCie has worked with a number of high-profile designers to make drives that range from simple and modern F.A. Porsche designs to more whimsical designs of Ora Ito. This latest collaboration with Philippe Starck and the Starck Desktop continues that trend. When I first connected the Starck Desktop, the LaCie Setup Assistant software started up on the Mac and asked how I would like to format the drive. I clicked on Mac and in seconds it was reformatted to Mac Journaled HFS (which also makes the Starck Desktop compatible with Time Machine). Both the Desktop and Mobile versions of the drive come with Intego Backup Assistant for Mac. While stylish looks and the focus on USB have become popular trends with drive manufacturers these days, LaCie still has a few tricks up their sleeves. The Starck Desktop allows you to customize the touch-sensitive front panel to open an application of your choosing. Depending on whether you lightly tap or firmly touch the curved button on the end of the drive, the Starck Desktop can be programmed to open different programs. Initially tapping on the button does nothing, as the shortcut button’s functionality must first be configured through the easy-to-understand LaCie Desktop Manager software. In seconds I was able to configure the button to launch applications of my choosing. Still, the functionality seems limited and just a bit gimmicky. Why not have two buttons instead of a touch-sensitive button? The ability to launch applications is somewhat useful if you plan on launching Time Machine or Photoshop, but call me shortsighted—I just don’t see the practical application of launching programs from your desktop drive. The Starck Desktop features a strong 3mm aluminum exterior. The Starck Desktop also features a status LED in the form of what LaCie calls “Starck’s signature symbol.” The status LED glows green or orange to indicate different activity. After working with the device for a while, I appreciated the subtlety of the lights compared to standard LEDs. In our lab tests, the Starck Desktop was above and beyond competing USB desktop drives that we've tested. Western Digital’s My Book Mac Edition ( ) finished our 1GB copy test at an impressive speed of forty-nine seconds, previously the best time for a USB device. 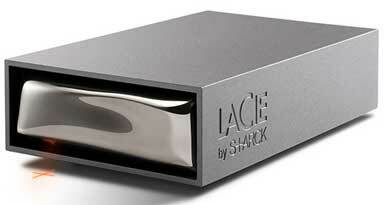 The Lacie Starck Desktop shattered that record, finishing a full seven seconds faster. The Starck Desktop’s duplication tests were also impressive, finishing our test in one minute and six seconds, a full eight seconds better than the My Book for Mac. The Low-Memory Photoshop tests were impressive as well and easily beat the competition with a time of one minute and seventeen seconds. This not only makes the Lacie Starck Desktop the fastest USB-only drive we’ve tested, but is the first USB-only drive to offer times competitive with some FireWire 800 drives. The Starck Desktop is available in 1TB and 2TB capacities. The entry-level model for the Desktop is priced at $130, giving the drive an impressive price per gigabyte of $.13. The Starck Desktop Hard Drive is one of the fastest USB drives we’ve tested. While its heavy, unconventional design may put-off some users and its gimmicky button won’t set the industry ablaze, LaCie makes up for any gaudiness with impressive scores. This is a desktop drive that Mac users should take a long look at.